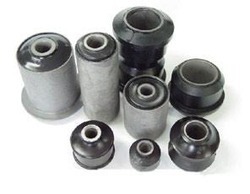 Our range of products include suspension bush. We are the most trusted name in the industry, providing high quality Suspension Bush that is used for various industrial applications. This profile is manufactured from the finest quality rubber and modern technology. The offered profile is available in various specifications to meet diverse requirements of clients. Also, this profile goes through various quality checks to ensure its fine finish. Our clients can avail this profile from us at very reasonable price.